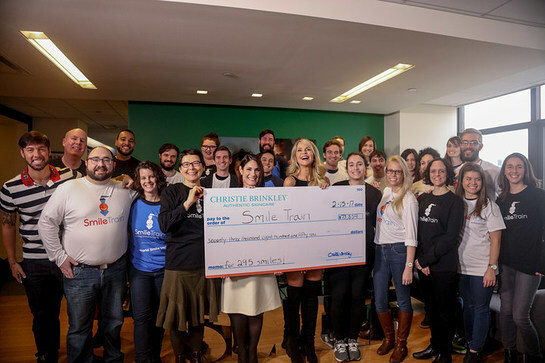 As part of her ongoing commitment to help children with clefts, Supermodel, Actress and Smile Train Goodwill Ambassador, Christie Brinkley, held a special event at Smile Train’s global headquarters where she presented a check for close to $75,000 to Smile Train’s CEO, Susannah Schaefer. The funds raised will help give 300 new smiles to children with clefts around the world. Alongside her skincare line, Christie Brinkley Authentic Skincare, the support comes from her commitment to donate 20 percent of the purchase price of each Ageless Beauty Set sold from May 2016 to December 2016 to Smile Train, the world’s largest cleft charity. “Through Christie Brinkley Authentic Skincare, I was able to use our Ageless Beauty Kit to benefit Smile Train. It’s important to me to present this check today, knowing that 300 cleft children will receive the surgery they need and have the opportunity for new lives. I’m excited to continue to help give children new smiles with Smile Train, an organization close to my heart, and see the difference we can make together,” said Brinkley. Brinkley has been a Smile Train Goodwill Ambassador for nearly 10 years and has helped raise much needed awareness of the issues faced by children living with untreated clefts around the world. This marks the second Smile Train initiative from Christie Brinkley Authentic Skincare since December 2015. Millions of children in developing countries with untreated clefts live in isolation and, more importantly, have difficulty eating, breathing and speaking. Smile Train’s sustainable model provides training, funding and resources to empower local doctors in the developing world to provide 100 percent-free cleft repair surgery and comprehensive cleft care in their own communities. Cleft repair surgery is simple, and the transformation is immediate. Since its founding in 1999, Smile Train has provided more than one million cleft repair surgeries. “The Ageless Beauty set was a special edition to the Christie Brinkley Authentic Skincare Collection as it supported a cause that Christie, and we as a company, support and are passionate about,” said Atlantic Coast Brands and Christie Brinkley Authentic Skincare, Co-founders Andrew J. Surwilo and Thomas Shipley. “To be able to give back and actually see that it is making a difference is very special to us and to Christie. We are thrilled that we were able to make such an impact with this donation,” said Surwilo and Shipley. To learn more about Smile Train’s global efforts please visit smiletrain.org and to make a donation to Christie’s fundraising page please visit www.smiletrain.org/christiebrinkley. For more information on Christie Brinkley Authentic Skincare please visit: ChristieBrinkleySkincare.com.